Jonathan Keith, a Scott County native who is now an archaeology grad student at Utah State University, explains how Cultural Resource Management protects archaeological sites at Scott County Public Library, December 19 at 6 p.m. Keith earned his anthropology degree from University of Louisville, and is completing his Master’s at Utah State. A profession combining academic and research disciplines, it “…is a combination of white-collar and blue-collar work, with much of it performed according to “…Cultural Resource Management standards stemming from the Antiquities Act of 1906, and National Historic Preservation Act of 1966,” explains Keith. The standards protect significant sites and prevent “…extensive damage in places like Danger Cave in Utah. Kentucky had an infamous looting incident at Slack Farm in the late 1980s that involved the looting of hundreds of Native American graves and burials; ultimately this incident led to more stringent laws and to the Native American Graves Protection and Repatriation Act,” said Jonathan. During two digs at the prehistoric Florida Everglades site, he joined a team performing “faunal” analysis on over 100,000 bones. Species ranged from large-mouth bass and alligator to a Florida Water Rat, pig frog and white-tailed deer. Jonathan also worked at the Pepper House, the historic homestead of Elijah and Oscar Pepper, the founders of Woodford Reserve. One of his favorite projects was recording architectural features of the Central Pacific Railroad through Utah, from near the western boundary of the state all the way to Golden Spike at Promontory Point. This free library program provides an up-close view of an unusual vocation that Jonathan finds very rewarding, as he documents artifacts that tell a story about the rich legacy of our nation’s history and culture. In the United States, Veterans Day is observed every November 11 and honors all veterans, past and present. It is distinct from Memorial Day, which traces its origins to the American Civil War and commemorates those killed in conflict. The first Veterans Day was observed in 1954, and came about after extensive lobbying on the part of World War II veterans for a more inclusive commemoration. Before then, however, the United States, along with other Allied nations reserved November 11 for “Armistice Day.” Armistice Day, which would later overlap with Remembrance Day in Europe, was first observed in the US on November 11, 1919. Promulgated by President Woodrow Wilson, it marked the anniversary of the armistice that concluded the World War a year earlier. America’s involvement in the conflict was brief, but transformational and traumatic. Over the course of eighteen months between April 1917 and November 1918, American society mobilized on an unprecedented scale, heralding the age of “total war.” Four million men would be conscripted into the military. Two million would eventually serve overseas in France. World-wide, some eighteen million people were killed during the four and half year conflict, a number that included 117,000 US servicemen. Roughly half of the Americans who died perished from disease, especially the dreaded Spanish Influenza. The remaining, some 53,000, were killed on the battlefield. Of those, nearly 26,000 died during the six-week Meuse-Argonne Campaign, alone. Part of the final offensive against the Germans that commenced in September of 1918, the operation encompassed more than 1 million American soldiers and to this day remains the largest and bloodiest military undertaking in American history. While the number of total American dead is dwarfed by the casualties of other conflicts such as the Civil War (750,000) or WWII (417,000), the vast majority of all losses suffered in WWI occurred within a six-month period. In twenty-four weeks of combat, the United States lost nearly as many killed as it did during the entire eight years of the war in Vietnam. Michael afterwards vowed to always wear a silk poppy in remembrance of those lost. Shortly thereafter, she struck upon the idea of selling them to the public in order raise money for disabled veterans. The idea was popular, and the “remembrance poppy” took hold in both America and Europe. In 2011, Corporal Frank Buckles, the last American WWI veteran, died at the age age of 110. With his passing the Great War moved from memory to history. We can longer directly ask the doughboys questions we might want to know: what motivated you to serve? How do you feel about your experience? How did it affect you, personally? What we are left with are veterans’ oral histories, memoirs, diaries, and letters as indirect links to that bygone era. Though Armistice Day is no longer commemorated as a separate holiday in America, as we near the centennial of the end of a conflict that saw American forces mobilized and killed on levels not seen before, it is perhaps fitting to reflect on the war one more time – about those who fought it, what they believed they were fighting for, and how it transformed the country – before it, too, like the last veteran, permanently fades from American historical consciousness. A new program on Cemetery Symbolism, set for Monday, October 8 at 6:30 p.m. features Johnna Waldon from Lexington Public Library. Walden, the president of the Kentucky Genealogy Society, considers genealogy a professional specialty and personal hobby. Listening to stories passed along to her by her grandmother, today she studies headstones and their inscriptions. Whether they appear on “big grand monuments or the small simple field stones” said Waldon, they reveal social, economic and historical context. Two historical footnotes confirm they also inspire moments of shared experience in that setting, and the lives of writer Henry Adams and First Lady Eleanor Roosevelt intersected at a famous gravesite in Rock Creek Cemetery in Maryland. Called the “Adams Memorial”, it was sculpted by Augustus Gaudens (1848-1907), in 1891. Gaudens is most famous for his bronze monument depicting Union Lieutenant Robert Gould Shaw, a privileged son of white, wealthy abolitionists, and the soldiers of the unit he led, one of the first African American regiments in the Civil War, who died together in battle. Henry Adams commissioned him to create a monument to his wife, Marian, said to be the inspiration for his novels, Daisy Miller and The Portrait of a Lady. A lively, vivacious and popular hostess and photographer, she committed suicide in 1885, after battling depression following the death of her father. 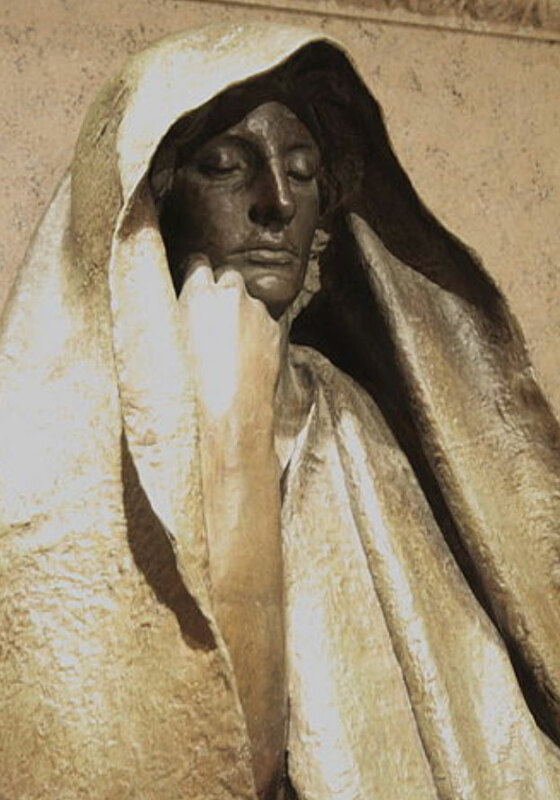 The monument is a stark, powerfully moving life-size statue of a woman shrouded in the graceful folds of a dark black granite cloak, her eyes closed. Soon it attracted ordinary visitors and prominent Americans, including Mark Twain. In 1918, Eleanor Roosevelt discovered a packet of love letters exchanged by her husband Franklin and her social secretary, Lucy Mercer. Devastated, she offered him his freedom, but a bargain was struck between them, at the urging of his mother, Sara, and for the sake of their children. Deeply troubled and grieving, Eleanor drove herself out to the cemetery to visit the Adams memorial, and reflect on its meaning. It is not surprising she later explained she found it comforting because it depicted someone who "transcended pain and hurt to achieve serenity." A library program begins as a simple entry on a calendar, followed by a phone call, e-mail or conversation with the person who will present the program. Yet the unique thing about a library, is how these conversations branch off in new directions, as in the story of the “mysterious memorial” to Marian Adams. Best of all, as Ms. Waldon shares her knowledge and experience, the visitors who give up their time to listen and participate will share theirs, just one more example of the way libraries enrich communities. And we intend to keep it that way. The ongoing controversy regarding how Facebook and Twitter platforms compromise user privacy is discouraging. Public libraries use Facebook every day to connect their community to the good news about library services and resources. Libraries also screen materials, collections and sources carefully to ensure the information provided is credible and accurate. Libraries help people enjoy life to the fullest, and to achieve whatever they set out to do. We strive for positive outcomes, yet we protect your privacy, too. Public libraries adhere to some of the strictest privacy standards around, guided by the American Library Association’s Bill of Rights. Those rights include diversity in collection development, meeting room use on an equitable basis, and best practices assuring you have the right to use your library without having the “subject of one’s interest examined or scrutinized by others.” The bottom line is when you use your card here, we keep any personally identifiable information private on your behalf. Executives and engineers at various social media sites seeking to protect privacy would be well served by studying different organizations like public libraries, who fulfill their stated mission to bring people and communities together, without compromising user privacy. This free concert brings award-winning folk performer Spook Handy to Scott County, in a celebration of music legend Pete Seeger, who died in 2014. Handy and his band present “Keep the Flame Alive – Remembering Pete Seeger” World Tour” September 9 at 2 p.m. in the library Community Room. Below is a story from Handy’s website about meeting Seeger, after Pete sent him a letter asking Spook permission to record his song, Vote. Thrilled by Seeger’s request, a few weeks later Pete invited Spook to join him in a performance in New York. as if searching for something -sizing me up. After a few seconds, he spoke. Michael Row the Boat Ashore and Good Night, Irene. Seeger’s career derailed after he refused to testify before the House Un-American Activities Committee in the 1950s. Despite the turmoil, he continued to record and perform children’s songs and folk music for audiences across the country. His popularity and positive civic influence peaked as a musical advocate for civil rights and peace in Vietnam during the 1960s. Spook Handy’s music blossomed after he walked away from a traditional 9-5 career path, and chose life as a singer song-writer, instead. After Spook’s song led to his friendship with Seeger, they performed together over 50 times over a decade. While Handy has a good idea of how he will open September’s concert, his play list will be shaped by the bond he and his band form with each new audience. Their passion and energy will connect you to the American folk tradition and Seeger’s enduring legacy – a legacy that celebrates the American spirit in good times and bad. Spook Handy Concert, Free Admission, September 9 at 2 p.m. in the library community room. What are the ten most influential books you have ever read? These would be the books that have touched your life in some way; awakened an interest, formed ideas or established a lifelong love. If you are a long-time reader it may be difficult to limit your list to only ten and your list may change with your moods. Here is my list of books I met before my sophomore year in high school which I loved dearly, thought about deeply or which changed the way I viewed my world. 1. Hitty, Her First Hundred Years by Rachel Field. The first “big” book I read by myself, this enchanting novel is a doll’s memoirs and is by turns haunting, hilarious and thought-provoking. 2. The Black Stallion series by Walter Farley. OK, I cheated a bit here. I was a horse-freak as a girl (still am) and I simply couldn’t get enough of these books. We read the first one, The Black Stallion as a family when I was in the second grade and then I was off and running, devouring the rest by myself. 3. The Secret Garden by Frances Hodgson Burnett. I was so immersed in Burnett’s garden I couldn’t tear myself away and so finished this book by flashlight under the covers. Shhhh. 4. Winnie the Pooh by A. A. Milne. Pooh was my first introduction to refined, understated literary humor. My sister and I read this aloud (with all the voices) to truly experience the magic of The Hundred Acre Woods. 5. My Friend Flicka by Mary O’Hara. Horses, again. But O’Hara’s world was vastly different from the less nuanced work of Farley with her beautiful, delicate descriptions that immerses the reader completely in her world. 6. Gone With the Wind by Margaret Mitchell. This was another after-dark-under-the-covers read for me. I had a deal with my mother – I could read what I wanted (in this case Mitchell’s iconic work) if I read The Deerslayer first. I read Fenimore’s plodding classic in the daylight hours so all could see what an obedient daughter I was but read all of Gone by flashlight at night under the covers. 7. Bury My Heart at Wounded Knee by Dee Brown. This is my epiphany book, the one after which I never saw the world, my nation and its history quite the same again. 8. Andersonville by MacKinlay Kantor. Kantor’s Pulitzer Prize-winning novel of the Confederate POW camp in Georgia has become the standard by which I have since judged every work of historical fiction ever since I read it one summer, baking in a lawn chair in my backyard, horror-struck and mesmerized by Kantor’s prose. 9. The Pickwick Papers by Charles Dickens. Mr. Pickwick and his misadventures introduced me to the classics in an entirely new way and I fell in love with Dickens and English literature as a result. 10. The Gulag Archipelago by Aleksandr Solzhenitsyn. Curiosity led me to read this expose of the Russian prison system written by one of the Soviet’s most famous defectors but through it I discovered a fascination with Russian literature that has never entirely left me. This is my list. What’s on yours? The Case of the Whiskered Trespasser, and a Day in the Life of Your Library. By the time most library patrons walk through our doors each day, a lot of lists and checklists have been completed. It begins with the very early morning arrival of our Director, Patti Burnside, who switches off the alarm system for the maintenance staff. Walking constantly throughout the facility each day, our maintenance crew appreciates an arrival punctuated by the sound of birdsong, and a quiet building, for now. More staffers arrive and start marking off those checklists. Empty the book drop, check. Unlock the doors at 9:00 a.m., check. Look at the schedule to figure out what task you will move on to next at what time. Make fresh coffee, for sure….check. As the phones ring and people arrive, the vibe in the building is cheerful, because we mean it when we say we enjoy helping the public. One late summer morning, we were greeted by a long-legged, meowing kitten, who scurried several times, through several entrances into the building. Affectionate and quite vocal, after his third trespass, we corralled him into an office, agreeing that he sure was sweet and cute, but chasing this leggy intruder through the halls could not continue. While some of us fetched water, (and swiped some half-n-half from a co-worker’s container) we carried bowls and small quilts, and a make shift litter box into an office. What kitty didn’t know was that his temporary shelter happened to be in Melissa’s office, a cat-lover who has done more than her share, over the years to save and care for homeless cats. Then our co-worker, Mike, stepped up the pressure, asking each one of us, (animal lovers all), if we needed another pet. His appeal was punctuated by the wailing meows of our captive library cat, who drained the water bowl, played in it for a time, jumped into a box of DVDs waiting to be cataloged, then spilled them onto the floor. Our library routine pleasantly and thoroughly disrupted, it was Patti who knew kitty deserved more than an admiring group of adults peering through the glass at this whiskered intruder. The Scott County Animal Shelter agreed to pick him up, keep him safe and healthy and find it a new home. In a mostly quiet environment filled with the hum of human voices, laughter, music, play and discovery, a break in routine can help to re-charge your outlook. A library is a unique community center, and as our cat rescue operation unfolded, reminded us that each day is unpredictable yet rewarding. So, besides herding a kitten, we enjoy answering questions, helping people download materials, or find that next great book to enjoy. That’s one constant in a library no one needs to add to a checklist, because it’s automatic and the best part of the job.